Carl Hoffman’s book on Michael Rockefeller, Savage Harvest, reviewed. A new book claims to have solved the mystery of Michael Rockefeller’s 1961 disappearance in the New Guinea jungle. Did Michael make it? Probably. Has Hoffman solved it? Sort of. In both cases, it’s complicated. I feel I’m in a good, if not unbiased, position to judge Hoffman’s efforts: I went to Asmat to investigate the mystery for Outside magazine and the Travel Channel in 2008. (And, full disclosure: I offered Hoffman some advice before his first trip to Asmat, supported a Kickstarter campaign that funded his second trip there, and am thanked in the book’s acknowledgements.) I told myself, as Hoffman does, that it was a story that touched on all sorts of fascinating anthropological, cultural, historical, and political questions. And it is. But if we’re being honest, its persistence and salability have more to do with a trio of less high-minded factors: Michael’s last name, the dearth of solid facts, and the grisly specter of cannibalism hovering over it all. 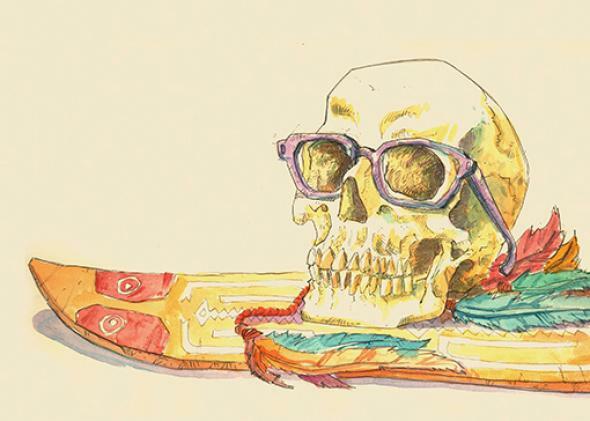 Hoffman believes he’s gotten past the myth, and his conclusion confirms the rumors that have been circulating since the 1960s: that Michael made shore and was quickly killed and eventually eaten by a group of men from the village of Otsjanep, who kept his bones, his skull, his underwear, and his glasses. The web of motives behind the killing is complicated, but involves the massive changes that were roiling the Asmat at the time, as well as payback for the murder, several years earlier, of five men from Otsjanep by a Dutch colonial patrol. Balance is of paramount importance in the Asmat cosmology, the theory goes, and they needed a white man’s skull to set things right. It sounds fantastical, but it is the same conclusion I and others reached previously. The fraternity of Rockefeller chasers is a small one, and we tend to be distrustful of new members, each of us passionate about and possessive of the story. I was prepared to dislike the book, put off by Hoffman’s arrogance in minimizing the work done by his predecessors, less me than people like Milt Machlin, the editor of Argosy magazine, who published a story about the mystery in 1969 and a book in 1972, after tracking down and interviewing the key Dutch missionary who had been living with the Asmat when Michael disappeared. Nonetheless, I came away impressed. Savage Harvest is a gripping read, and though Hoffman’s conclusion may be familiar, he’s erected a solid foundation of reporting that goes far beyond what the rest of us did and is likely to make this the definitive account. To travel to Asmat is to travel a great distance—geographically, yes, but also historically, culturally, and cosmologically. The region is navigable only by boat, a land of rivers and mud, mangrove swamps and tidal flows, and a few dozen thatched-hut villages built on stilts. The standard of living has hardly advanced past the primitive, and white visitors are still a relative rarity. Adding to its strangeness is a belief system in which the spirit world is always tangibly present and ritualistic headhunting and cannibalism are fundamental aspects: The Asmat origin myth, passed down orally through the generations, contains detailed instructions for the butchering of a man and the preparation of his skull. Michael Rockefeller went there with a serious ambition, to collect carvings for the Museum of Primitive Art in New York, founded by his father. And he set about the task purposefully, rapidly amassing a large collection, now on display in the Metropolitan Museum of Art in New York. But as his journals make clear, he was also a young man living out an adventure. “The only difference between Mark Twain and us is that his characters used poles all the time while we use an outboard engine most of the time,” he wrote in his Asmat journal. The reference to Twain is telling: There was a bit of Tom Sawyer in Michael, as there has been in all of us who have gone looking for him since. I was 29 when I went to Asmat, older than Michael but younger than Hoffman, still caught in the grip of youthful impetuosity and confidence. I had been intrigued by Michael’s story since first coming across it as an undergraduate, and when the chance arose to go to Asmat, I leapt, mostly without looking. But without a little naïveté, you’d never go to a place like Asmat, so I’m less critical than Hoffman of Michael’s wide-eyed enthusiasm and occasional blind spots. My expedition there, driven along by the exigencies of a TV production and insulated from locals by an entourage of translators and boatmen and camera crew, didn’t stand a chance of uncovering much new evidence, though we did add a few important pieces to the dossier. The climax of our program was my attempt to replicate Michael’s swim to shore to try to deduce whether it was possible he’d made it. I swam probably 5 or 6 miles with an incoming tide and made it to shore. Michael’s swim would likely have been longer—8 to 10 miles, perhaps—but my success made it seem doable. Their reputation, after all, precedes them: Theirs was a warrior culture, centered on reciprocal violence. Knowing all that, it was hard not to feel the tragedy of what they’d lost. They are, in Hoffman’s phrase, “warriors with no war to fight,” and though nobody would condone a return to what’s euphemistically called “the old ways”—killing and eating each other—it’s impossible to look at these people and not want them to have some sense of self rebuilt. “We are Catholics now,” many men told me when I asked about headhunting, and then they looked away and rolled a cigarette. That’s a phrase Hoffman uses late in the book, just before his second trip to Asmat, giving voice to his lingering doubts after spending several pages unspooling the ample evidence he’s accumulated for the killed-and-eaten theory. And his evidence is persuasive, largely because it doesn’t rely on his trips to Asmat. Hoffman’s revolutionary stroke was in realizing that actual evidence would not likely be found in Asmat—too many decades had passed, too many others had preceded him—and in having the maturity and shoe-leather reporting diligence to follow the long paper trail that had remained in various archives all these years, mostly unglimpsed. The reports and communiqués he unearthed, along with interviews with some of their protagonists—the aging Dutch missionaries and colonial officers who had been in Asmat at the time—form the backbone of his argument. What those documents offer is ample corroboration of Rockefeller’s murder from the only Westerners in Asmat at the time, as well as evidence of efforts by the Dutch government and the Catholic missionary orders to keep this version of events secret for a variety of complicated historical and political reasons. What they don’t offer is a smoking gun: It all fits together and points toward a conclusion, but these are secondhand puzzle pieces. There is no direct confession, no skull or other identifying artifact. So the mystery remains, owing in part to the essential unknowability of the Asmat people. 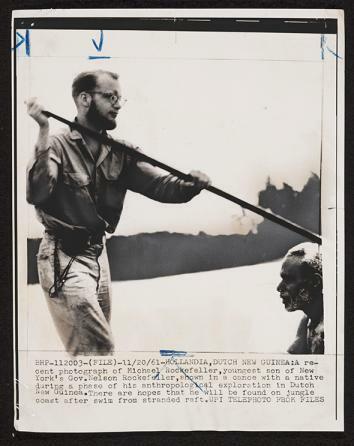 Michael Rockefeller paddling an Asmat canoe, 1961. By now the Asmat know that white people come to their villages, and Otsjanep in particular, for two main reasons: to bring Jesus into their lives or to ask about Michael Rockefeller. Those of us who have come before have polluted the stream. And what little they say about Michael or anything else suffers from a problem of severe narrative unreliability. “Asmat reveal some things and don’t reveal others,” Hoffman notes. “When pressed by outsiders, they will sometimes concoct stories to satisfy them.” Our experience there bore this out. Villagers would string us along and dissemble, at times seeming to almost pantomime their own culture for us, knowing what we wanted to see—drumming, a canoe flotilla, traditional dress and weapons—and giving it to us, along with a few dubious stories, in exchange for the tobacco and other goods we’d brought. But in the end it would come to nothing. And beyond the non-answers and possible play-acting, the more problematic consideration is that the entire story of Otsjanep killing Michael may have been invented as a sort of wish fulfillment at a time when incursions by white men were upending the Asmat world. It would have made Otsjanep seem more powerful in the eyes of its enemies. And once the rumor started, it would have propagated through the echo chamber of village gossip, a game of telephone that made its way throughout the region and to the white men—the missionaries and Dutch officials—whose stories Hoffman found in the archives. Is it more likely than not that the rumors are true, that the Asmat killed and ate the young Rockefeller? Yes, certainly. Savage Harvest: A Tale of Cannibals, Colonialism, and Michael Rockefeller’s Tragic Quest for Primitive Art by Carl Hoffman. William Morrow.